2018 is coming fast which means it's time for Winter and Spring Catalogs to get out to the public. Whether you are promoting an advertising catalog, educational catalog, equipment catalog, product catalog, food & beverage catalogs, apparel catalogs, sporting goods catalogs and so much more! Here at PrintingCenterUSA, we have several Catalog printing services to make sure your 2018 Catalog is the best on the market. First, let's define catalog. We define catalogs as displaying and promoting a collection of products and or services to increase sales efforts for your products and may include images, illustrations, design elements, graphics, charts, or pictures that attract attention. A bit of mouthful, right? Don't worry! A catalog can basically build itself if you have good information and good products. If this is your first catalog, we will give you all of the tools you need to produce something fantastic at a great price! Start by reading our three main starting points that you need to make a fantastic catalog. What Do You Need To Start Your Catalog? The first thing you need to start your catalog is images of your products. Find someone to take high quality photos and try to organize them in a way that would make sense to the buyer or person seeking information. Don't forget that in order for pictures to be printed with a high resolution, they need to be 300 dpi. Most photos you might find online are normally only 72 dpi, because they are formulated for the web. Collecting decent photos might be the most important part of the catalog printing process. If your photos aren't decent quality, you won't sell what you need to sell, be it products or just information. A picture is worth a thousand words, a true cliche that shouldn't be taken for granted. The second thing you need is a design software to organize your images and information in an attractive way. We have easy start templates so that your files can start off error free and helps making the printing process easier. Not everyone has access to that, and we understand. Which is why we offer a free design tool that you can use from the comfort of your home or office! Click here to view our catalog design tool and explore it for yourself! Not a designer? Don't want that hassle? Not a problem! Hire one of our favorite designers to do the hard work for you! Of course, if you already have your designs print ready, you can upload your files at the time you place your order. You don't have to use our software, but we have free templates and a design tool if you need them! The third thing you need to make a sucessful catalog is a #1 Rated Printing Service to get the job done right. See where we are getting at here? (Insert eyebrow raises and sly smile). 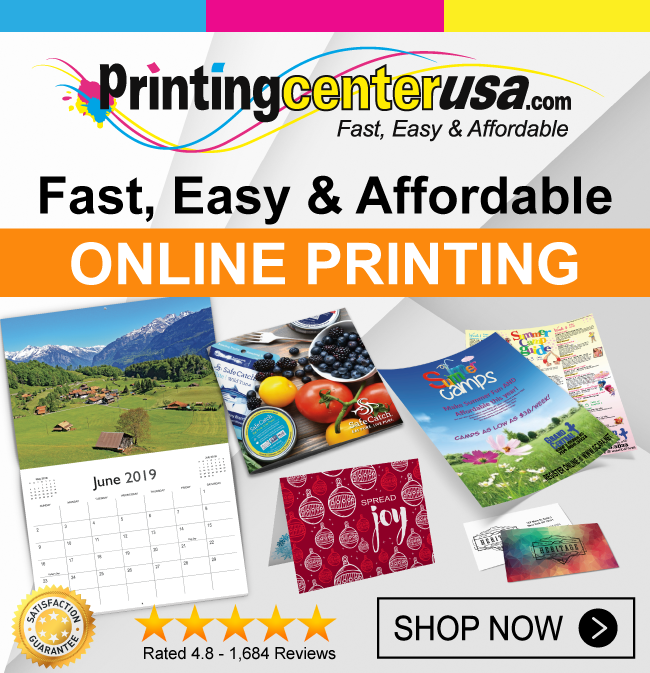 PrintingCenterUSA is a top quality and affordable printing company with actual affordable pricing! We not only give you tools to help you create your perfect catalog, but we will walk you through the printing process so that you get exactly what you want. We print for all types of associations, including school & education, business, church & religion, health, nonprofit and arts & entertainment. You will be amazed at our quality, and your business or organization will be rushing back to us every year. Don't believe us? Read our reviews here. Hundreds of satisfied customers can't be wrong! Read our tips and tricks for building a successful catalog, no matter what kind of catalog you need! And don't forget to subscribe to our email list to never miss out special deals, discounts, and design tips! Why You Need To Start Using Brochures Peaceful Moon Photography Calendar is a Success!